The sculpture stnds in the Villa Romana garden until the onset of winter and can be viewed and used during office hours (Mon – Fri 9am – 7pm) and on appointment. A garden is a closed space, in which we realize our beliefs in and our visions of social and natural ideal(s). It is an island, not a fathomless place such as utopia. The garden is a showcase space, 1:1 implemented in the ground. It does not separate imagination from reality. A garden needs walls for its protection. The Villa Romana garden has for the most part taken shape over the last 30 years. Different zones were created on the 15,000 meters square area of land, niches were created and personal dedications were installed in order to celebrate visions of a bohemian life. Although the Villa Romana building was extensively restored in 2006/2007, the structure and furniture of the garden has remained untouched until now. With the RURAL DELIGHTS project, Villa Romana raises the question of how to use and design the garden of a contemporary artists’ residence. Inviting the Berlin sculptor, Kai Schiemenz, is a first initiative for adoption and public discussion. RURAL DELIGHTS renegotiates the garden as an area of social and political actions. On the garden’s upper slope is a meadow, surrounded by neighbouring buildings. 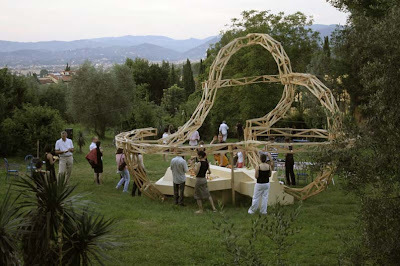 Here Kai Schiemenz has placed his plywood structure, which paraphrases a type of gazebo, such as can be found in parks and public sites and which is usually free standing and shade producing. 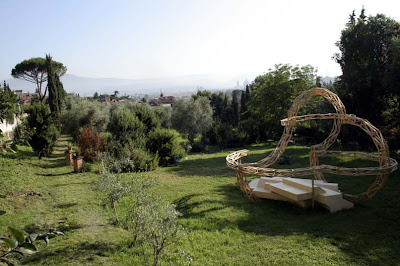 Kai Schiemenz uses the ornamental qualities of this classical piece of garden architecture and its function as place of shelter for small and large groups. 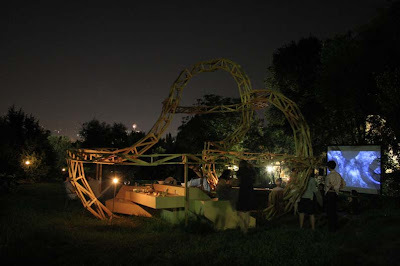 The structure of his sculpture, which is accessible from all sides, serves as a testing ground for discussions, performances and film showings… It is a matter of designing a public area and the dimensions of producing and relaying knowledge. The first garden forum starts on 21 June. Architects, sociologists, dancers and film producers from Germany and Italy are invited to the evening to present their work (see below for programme). 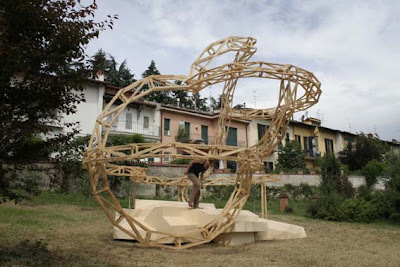 During the summer, other actors will use Kai Schiemenz’s ‘Archisculpture’. The Italian curator Lorenzo Bruni is preparing two project weekends, in co-operation with artists from the regional and international scene, with the title "Noi adesso siamo qua". The sculptor Kai Schiemenz, who lives in Berlin (born 1966 in Erfurt), works with plastic space models. For some years, his research has been directed at areas of social organization and projection. A prototype of this is the stadium. Kai Schiemenz has collected an extensive atlas of pictures on the archaeology of the stadium from the ancient arena to the mass-medial container, excerpts of which are exhibited in Villa Romana. 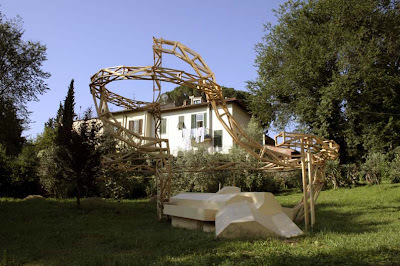 In the garden of Villa Romana, Kai Schiemenz has realised a work several meters high consisting of two formal levels: a layered and tilted ground architecture (which calls to mind stage elements as well as the ice floes in Caspar David Friedrich’s painting) and semi-circles rising upwards, whose fragmented technical construction takes up the idea of the Disegno as well as the dynamics of a rollercoaster. The sculpture signifies a virtual area and an actual place. Peter Pleyer, artistic director of the Berlin dance days since 2007. After some years as an actor in the German speech theatre, Peter Pleyer studied dance at the "European Dance Development Center" at the academy of art in Arnhem, the Netherlands. He worked as a dancer and choreographic assistant with Yoschiko Chuma in New York and Mark Tompkins in Paris and, since his period of study with the Hungarian dancer Eszter Gal. Joint choreographies and improvisations have been shown in Holland, Germany, France and Hungary as well as at the New York improvisation festival. He teaches at various dance festivals in Europe and has helped to create higher education courses for contemporary dance in Berlin. Sandra Bartoli, born 1967 in Cortina d’ Ampezzo, lives and works in Berlin. She studied architecture and landscape architecture and is the co-founder of Terraform with Andreas Ziegeler. Together with Silvan Linden, she created the Office for Constructivism in 2006. The office publishes the magazine Die Planung / A Terv (with Martin Conrads, Levente Polyák and Katarina Šević) as well as the publication Kristalle (published in the "disko" series of publications of the Nuremberg Academy of Fine Arts). Stefan Schreck, born 1968 in Cologne, studied journalism and German studies in Cologne, Düsseldorf and Berlin. He is the co-founder of the (net) radio collective convex tv by mikro e.V. - an association to support media cultures and of the edit suisse group. Since 1995 he has worked as a freelance sound designer, author, data base developer, web designer and web programmer in Berlin. Helmut Höge, born 1947, worked first as an interpreter in the US Air Force and for an Indian animal dealer, then studied social sciences in Berlin, Bremen and Paris. He subsequently worked as a farmhand on various farms in West and East Germany as well as in Italy and in addition he began to work in journalism. Since 1986, he has earned his money through journalism. Finally, the following were released by him: "Neurosibirsk" (publishing house Peter Engstler, Ostheim/Rhön 2006) and "WPP - Wölfe Partisanen Prostituierte" (Wolves partisans prostitute) (cultural publishing house Kadmos, Berlin 2007). An essay collection is in preparation with the title "Anti- Darwin" (together with Peter Berz and Cord Riechelmann as editors) as well as a book about agriculture and farmers. Minze Tummescheit and Arne Hector work together as "cinéma copains" on the production of documentary films. The focus of their interest is humans in the context of their social and economic conditions. Between 2000 and 2004, the film "Jarmark Europa" was made, which premiered in the forum program of the Berlinale 2004 and was shown among other places at the exhibition "Steps for the Flight from Labor to Doing" in the Museum Ludwig. At present, the "cinéma copains" are working on the production of ‘in arbeit/lavori in corso/en construction/w toku’, a series of interviews on film, which explore the possibilities and conditions of working collaboratively and the adaptability of social actions.